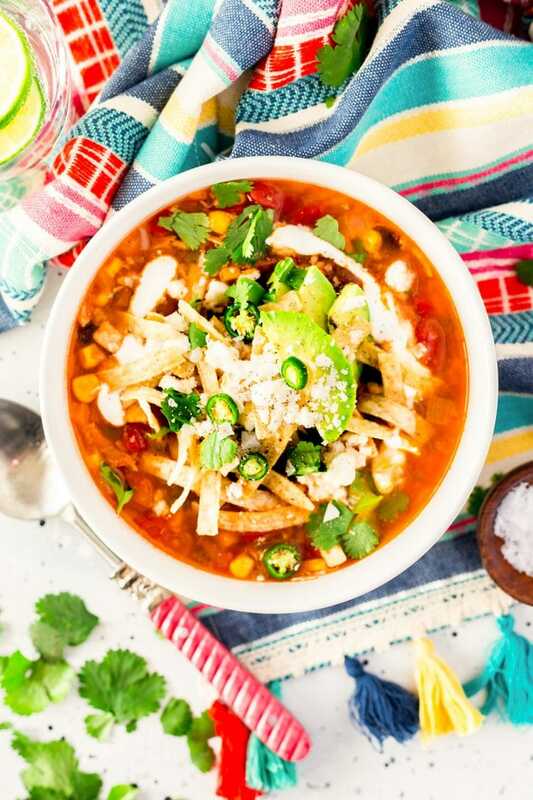 This Slow Cooker Chicken Tortilla Soup is loaded with delicious ingredients like chicken, peppers, tomatoes, corn, and beans and the bold flavor of garlic and cayenne! A comforting and hot meal for chilly nights! There’s nothing quite as comforting as a steaming bowl of soup on a cold winter day. Make it wholesome with a hint of spice, and you’ll be warmed from the inside out. 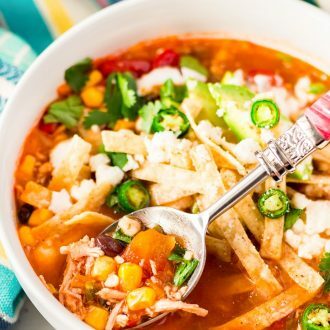 This Slow Cooker Chicken Tortilla Soup recipe will thaw you to the bone with its hearty ingredients and fire-roasted flavor. I love Southwestern-based soups, so in light of the cold spell that’s fallen over the country, I figured I’d try my hand at making my own. Although I don’t work in an office setting anymore, I like having pre-made lunches readily available as a time and money saver. If I’m working from home, taking an hour or two to prepare and eat lunch is distracting and time-consuming. But when I make a big batch of Tortilla Soup to keep in my fridge or pack in a thermos, I’m not only ready for the midday stomach grumbles, I’m able to resist temptation! This smoky, spicy soup features juicy shredded chicken, fire-roasted tomatoes and corn, black beans, peppers, onions, and bold spices like cumin, garlic, and a dose of cayenne. If you’re in the market for a new slow cooker, this one is my favorite, I love that it’s equipped for on-to-go and that it has a programmable menu. Each cozy bowl of goodness is made extra vibrant when it’s topped with cilantro, queso fresco, crema, a squeeze of lime, and crunchy tortilla strips! I often eat Tortilla Soup with a handful of tortilla chips too, which I use to scoop up the hearty contents of the soup. The other reason I enjoy making this Chicken Tortilla Soup recipe is that it’s easy! Throw all the ingredients together and the slow cooker does all the work. It does take 8-10 hours to cook, so it’s a great meal to prepare for a rainy or snowy day morning, and you’ll be able to enjoy it that night. The only additional step is to pull the chicken breasts out of the crock pot a half hour before serving to shred them, then add them back to the pot. You can enjoy the batch for days… in fact, I think it tastes best after the flavors have been able to set for a day or so! 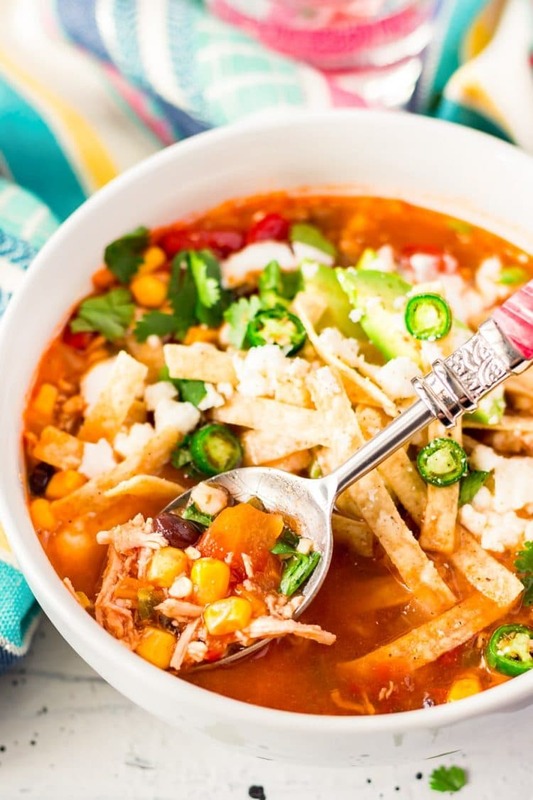 This easy Chicken Tortilla Soup recipe is like a smoky, spicy bowl of comfort. It’s a tasty, hearty, meal that will warm you to your core, even on the coldest of days. And it has less than 250 calories per serving! How Do You Make Chicken Tortilla Soup in the Slow Cooker? Place the chicken breast at the bottom of a slow cooker. Whisk together the spices in a small bowl, then pour over the chicken and pat down firmly. Add the red onion, bell pepper, and diced serrano, then dump in the tomatoes, corn, and black beans. Slowly pour in the chicken broth and water, then whisk in the tomato paste. Cover and cook on low for 8-10 hours. 30 minutes before serving, carefully remove the chicken breasts and shred with a fork, then carefully stir it back into the soup. Serve with tortilla strips and queso fresco, and garnish with cilantro and crema as desired. 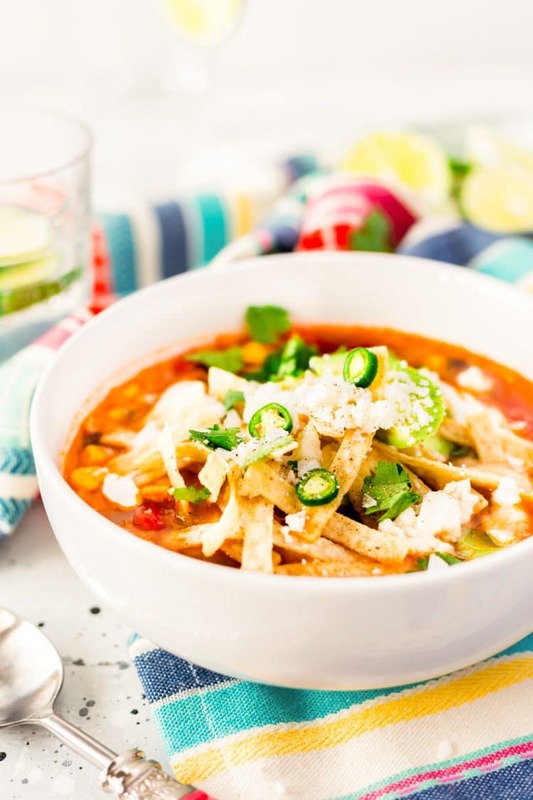 Pin this Chicken Tortilla Soup Recipe for Later! This recipe was originally published in June 2013 and was updated in January 2018. Place the chicken breast at the bottom of a slow cooker. Whisk together the spices in a small bowl, then pour over the chicken and pat down firmly. Slowly pour in the chicken broth and water, then whisk in the tomato paste. Cover and cook on low for 8-10 hours. 30 minutes before serving, carefully remove the chicken breasts and shred with a fork, then carefully stir it back into the soup. I love soup year round too, some people hate it though. But a little southwestern kick never hurt anyone. Thanks for stopping by, Zannie! Yum! This looks really good! Looks good and easy to make-that’s our kind of recipe! Thanks for linking back to us! Thanks for having me and always hosting a fabulous party! Thanks for stopping by Nicole. Following you back! Anything with limes sounds yummy to me ! I loves lime, it’s a great kick for any southwestern dish! Thanks for stopping by Steph! Thanks for stopping by, I hope you get a chance to make this! This looks so delicious! Would love for you to share at Simple & Sweet Fridays! New Follower! Thanks for following and I’ll be sure to stop by! It’s such a great ingredient and there is so much you can do with it! That looks good! My co-worker just asked me if I ever tried quinoa. I may need to now with your recipe. thanks for sharing with us @ My Favorite Posts SHOW OFF Weekend Blog Party! It’s a great grain and there is so much you can do with it! Definitely give it a try! Thanks for stopping by! What a fab idea to add the quinoa! 🙂 Thank you so much for linking up with me this week at Tasty Tuesdays! I’ve pinned this & shared it with my followers! Please be sure to stop back by the party and check out some of the other links! Thanks for having me, Anyonita! It’s always a pleasure to party with you! I am just in love with this! Any way I can sneak some quinoa to my husband. 🙂 I am pinning right now. Quinoa is so good isn’t it! Thanks for stopping by and i’ll be sure to link up again this week! Following you back! Thanks for stopping by and for hosting the party! I need to invest in a slow-cooker, just for this recipe! It has been years since I´ve had tortilla soup and your version just sounds so amazing, love all the flavors you incorporated into this recipe, and it´s so easy to put together…cheers! Yes, you do, there are so many great recipes you can make in them. Hope you get a chance to try this recipe soon!